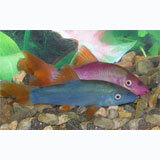 Shy, rather aggressive fish that is active only during the evening and the night. The aquarium should be set up with stones and driftwood because they need hiding places. The substrate should be sandy because they dig a lot, and if you want to use plants, they should be anchored very well. You should dim the light by using floating plants. A regular changing of the water is necessary. They are omnivorous. You should give them a great variety of live, frozen and dry food. They possess cheek spines that may become entangled in nets.